This imaginative study of American visual culture reveals how the political predicaments of a few small bureaucracies once fostered pictures of an extraordinary style. U.S. geographical and geological surveys of the late nineteenth century produced photographs and drawings of topography, American Indians, geologic features, botanical specimens, and specialists at work in the field. Some of these pictures have long been celebrated for their anticipation of a modernist aesthetic, but Robin Kelsey, in this abundantly illustrated volume, traces their modernistic qualities to archival ingenuity. The technical and promotional needs of surveys, Kelsey argues, fostered the emergence of a taut, graphic pictorial style that imitated the informational clarity of diagrams and maps. As this book demonstrates, these pictures became sites of struggle as well as innovation when three brilliant survey artists and photographers subtly resisted the programs they were hired to serve. 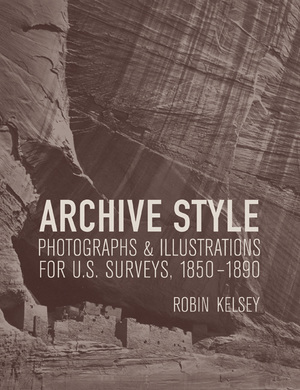 Discovering a politics of style behind the modernist look of survey pictures, Kelsey offers a fresh interpretation of canonical western expedition photographs by Timothy H. O'Sullivan and introduces two exceptional but largely forgotten sets of pictures: views of the U.S.-Mexico boundary from the 1850s by Arthur Schott and photographs of the Charleston earthquake of 1886 by C. C. Jones. Robin Kelsey is John L. Loeb Associate Professor of the Humanities at Harvard University.